The birthplace of sculptor Joseph Nollekins. Description: Revered 19th century sculptor Joseph Nollekens R.A. (1737-1823) was born here, son of Antwerp-born Flemish painter Josef Frans Nollekens. 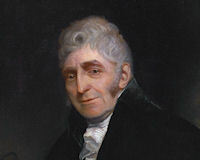 He studied art in Rome and returned to London in 1770, establishing a practice supplying busts and monuments from Mortimer Street. He sculpted for King George III, William Pitt the Younger, Charles James Fox, the Duke of Bedford and Charles Watson-Wentworth.